Most kids love muesli bars – but the ones from the shops are often filled with additives, preservatives and refined sugars. So home-made is a great option. 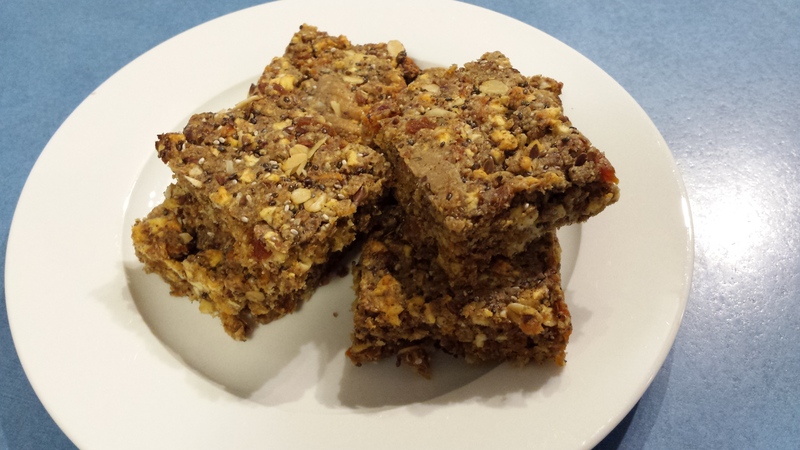 ‘Hugh’s muesli bars’ that I have previously posted about don’t hold together so well when they are out of the fridge for long periods of time, so they aren’t the best for lunchboxes. After a bit of tinkering, I think I’m on to a delicious and chewy winner 🙂 We call this one ‘Superhero slice’ because of all the great stuff in it to give you great energy! 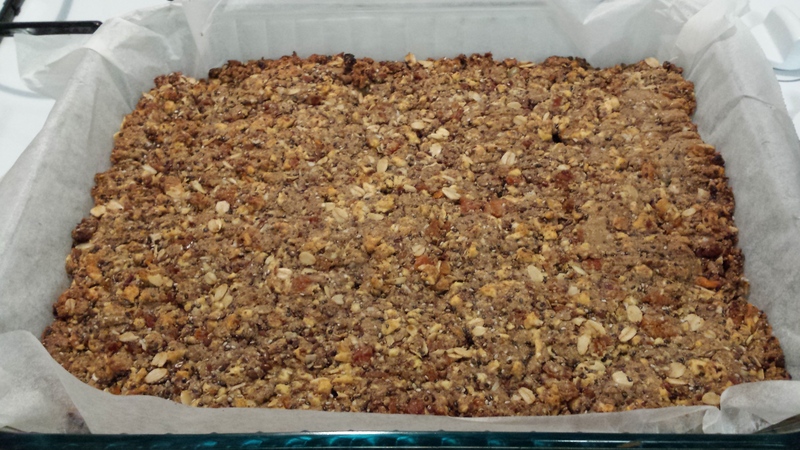 Mill the seeds, quinoa and pysllium together until you reach a consistency that resembles almond meal …. don’t go too far or you’ll get a paste! Set aside. 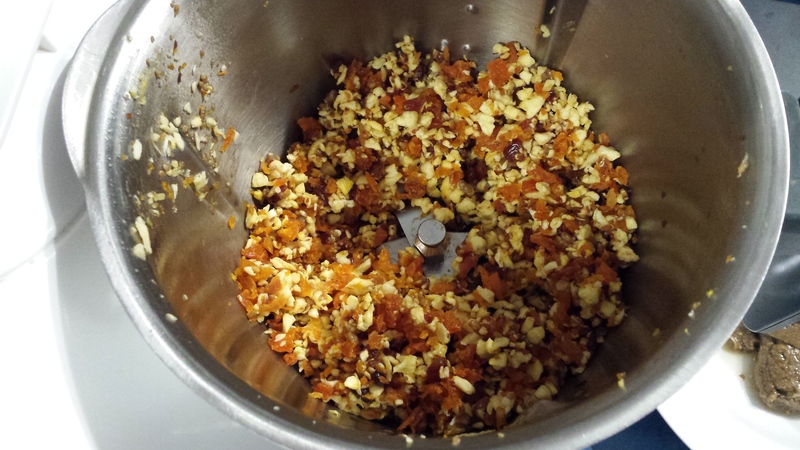 In a food processor blitz together the apple and apricots (speed 8 for about 15 seconds in a thermal cooker), then add the dates one at a time through the chute at the top (speed 4 while you are adding then up to 7 for 15 seconds). Add the milled seed mix to the fruit and process until well combined (speed 4 for 20 seconds). Add the sunflower seed butter, zest and juice and process again until well combined (speed 4 for about 30 seconds). Add the oats or puffed rice and process until evenly distributed (Speed 4 15 seconds). Press down very firmly (I used my hands and then back of a fork) into a lined tin and place in a 160C preheated oven for about 30 minutes or until the top is golden. Allow to cool and cut into squares or bars and keep in an air tight container. Ours lasts 2 weeks in the fridge. Makes about 24 squares. Natasha, I’m pretty sure you can get organic apricots that are sulphite free. Good luck!